Valentine's Day isn't quite over at our house. We're still enjoying a wonderful, homemade card from Monkey & Roo (and Nadine). It actually arrived on Valentine's Day proper, which was so nice. A very big thanks to the crew over at Hello world it's me, and hugs from us, all the way across an ocean. We love the card and we love it even more that the talented and always hilarious Nadine stumbled upon this blog back in 2007 and has been a loyal reader ever since. Now, Q & The Boy have their own internet pen pals with Monkey & Roo. Next year, I say we go to the Netherlands to give Monkey, Roo, FreezeM, and Nadine their card in person. Thanks again, Nadine and family. And thank you for YOUR card. I love the robot and the little princess. I'll post a photo of that soon. I have been enjoying reading RM's site and beautiful stories. RM's subtle and touching way with words is like a magnet and I really think he should write more than "just" blog. You should definitely come to The Netherlands! :) We would love to meet! Oh, how adorable!!! I can feel the transatlantic love, even from here! 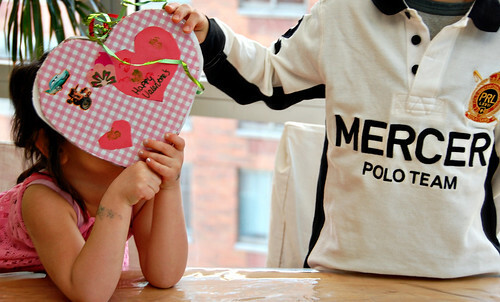 Ok, now I need to start having some kids so they can participate in this Valentine's Day card exchange!